While some guests prefer to relax by the fire with a book and a glass of wine, a guided tour of the property is offered. 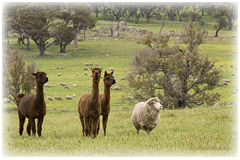 Visitors get close to the alpacas, sheep and lambs in season. If time permits a walk through the woolshed can include a demonstration of spinning. An explanation of the revegetation in progress is also available. Visitors are welcome to walk around the farm and even plant a tree in the winter. While some supervision is necessary, Eden Valley is a safe environment for small children.